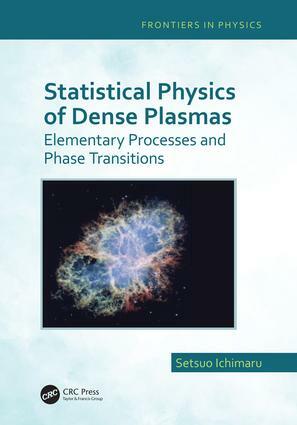 This authoritative text offers a complete overview on the statistical mechanics and electrodynamics of physical processes in dense plasma systems. The author emphasizes laboratory-based experiments and astrophysical observations of plasma phenomena, elucidated through the　fundamentals. The coverage encompasses relevant condensed matter physics, atomic physics, nuclear physics, and astrophysics, including such key topics as phase transitions, transport, optical and nuclear processes. This essential resource also addresses exciting, cutting edge topics in the field, including metallic hydrogen, stellar and planetary magnetisms, pycnonuclear reactions, and gravitational waves. Scientists, researchers, and students in plasma physics, condensed matter physics, materials science, atomic physics, nuclear physics, and astrophysics will benefit from this work. Setsuo Ichimaru is a distinguished professor at the University of Tokyo, and has been a visiting member at The Institute for Advanced Study in Princeton, New Jersey, at the University of California, San Diego (UCSD), the Institute for Theoretical Physics at Johannes Kepler University, and the Max Planck Institute for Quantum Optics. He is a recipient of the Subramanyan Chandrasekhar Prize of Plasma Physics from the Association of Asia-Pacific Physical Societies and the Humboldt Research Award from the Alexander von Humboldt Foundation.